Ted Drayton, a member of Footscray Harriers, was one of the best walkers in the period before the First World War. He and Bill Murray (who represented Australia in the 1912 Stockholm Olympics) were instrumental in setting up the Melbourne Walkers Club and they had many fine battles in the various walking titles of the times. In 1914, he was second to Murray in both the Victorian State 10 mile and 25 mile championships and the results were the same in the 1915 titles. However, as the War started to bite, VAAA ceased all competitions and the then Melbourne Walkers Club went out of existence. It was not till the club was reformed in 1921 as the Victorian Race Walking Club that Ted returned to walking. A member of the Footscray club, he was captain of the Victorian team in the inaugural 1923 interstate walking carnival that marked the start of regular interstate walking. In that event over 7 miles, he finished 9th in 59:22. Although he never won a Victorian Championship, he always occupied a prominent position. On 6 occasions, he finished second and he had a best time for 7 miles inside 57 minutes. He was Club Captain from 1923 to 1927 and became club President in 1931. He spent 6 years at the helm of the club before passing the Presidency onto Alf Robinson in 1937. By this time he had well and truly retired from competition and was a regular judge as well as administrator. 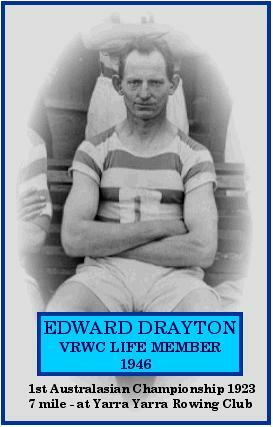 After the club was reformed in 1946 after the war, he was awarded a life membership and the Ted Drayton Trophy was instituted. It was contested for many years and served as a fitting reminder of his vast contribution to the club over a long period of time.